I love art. I feel most peaceful wandering around galleries and museums, looking into the mind of another. It’s Day 27 of my quest to get us a 2014 National Nurses Day Google Doodle, and I wrote to the doodlers about some nurse artists that I think are pretty fantastic. I also shared some of my thoughts on why people don’t seem to recognize the intrinsic creativity of our profession – at and away from the bedside. Day 27 of my quest to convince you to doodle on behalf of nurses! Only three days till Nurses Day!? I just came back from some gallery openings. Odd, the energy of Keith Haring caught me with a far tighter grasp than the portrait show I thought I’d prefer at the gallery next door. His lines, sometimes sloppy sometimes exact, felt living, screaming, full of breath. The portraits – I’ve forgotten her name even now – were beautiful, but lacking in vision. I didn’t expect to like Haring – too commercial, I initially thought – but standing before them, I could hear his message, see his pain, sense his anxiety in those canvases. Teens taking selfies aside, the show brought me to a brief escape, which is the reason why I run to art most of the time. Right before I biked over to the shows, I was at a casual roof party at a friend’s house. Everyone in the small group was what people around here call, “Creative Professionals.” Radio, music, policy, etc., I was, as I often feel I am, quickly written off as a “non” after introducing my profession to the conversation. Usual questions peppered the banter – have you seen a lot of dead people? – but no inquiry or acknowledgement of my personal and professional urge to create. Why would there be? For most, a nurse is not a typically creative person.A nurse is one who follows orders and protocols. A nurse is a person who serves a crucial purpose in society, but are nurses really creative? I find this frustrating, considering myself a creative, if even artist person. The longer I live in this town, and the longer I’m a nurse, I search for ways to bring to light my desire to create through, and because of, nursing. Sometimes, simply because I’m tired of being labeled at cocktail parties, but mostly, because I think nurses might be the most creative profession out there. Aside from the innovation that bedside nursing requires; the ability to juggle multiple patients, communicate with multiple doctors, maneuver multiple personalities, etc, lies a world of creative nursing to be discovered. It’s just frustrating to me, as I scroll through Instagram, walk through galleries, and check out creative types all over my neighborhood, that no nurses seem to be amongst them. Where are we, if not swallowed by the weight of our jobs? I recently discovered a nurse artist close to home – here in New York. An art-school-drop-out-slash-holistic-expert, she currently works as a cardiothoracic ICU nurse in Manhattan. This means, she cares for people who have just had their heart operated on. Talk about a need for escape. But Valley Fox doesn’t stop after her 12-hour shift. She’s a painter, with a studio, exhibiting some pretty powerful art. Her piece, Epinephrine, to me, looks like the drug I’ve seen start a person’s heart again. Its movement is palpable even through my computer screen; a heart on fire, a life restarted, a powerful attempt to save, that can also destroy. Her blend of the colors of nursing with the colors of art is flawless in its execution, almost too striking to see. Juliana Paradisi is another artist who uses her nursing talent to create. Her work is folk-like, beautiful in its simplicity and power. 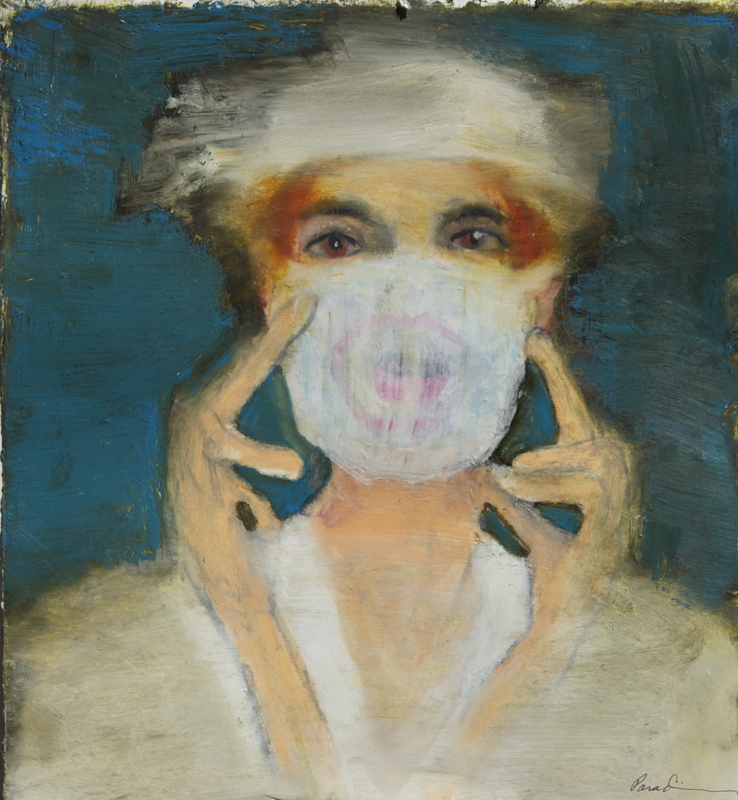 An oncology nurse, she likely has to frequently don protective garb to give her patients chemo; her piece Sometimes My Surgical Mask Feels Like A Gag shows her job’s hidden sexuality, combined with its tedium. I love her work, I love herwriting and her tweeting. My own artistic bend, which I’ve long retired to doodles for birthday cards and art collecting, craves for more art like hers. These women work as nurses and as artists. It seems, from my outsider view, that their “callings” might be inseparable; to nurse is to create, to paint is to create. The list continues for nurses all over the country, far past painting alone. But why am I not going to these nurse-inspired exhibits in Chelsea? Why are we not seeing nurse fashion designers, nurse performance artists, nurse celebrities? They are out there, I am sure. I look for more of them all the time, wondering why we as a profession, are so shy with our creativity, so humble with our talent. Someday, I want to see nurse artists everywhere, in every creative landscape — why not? We tend to the moments surrounding life and death; what could be more artistic?